After watching this video from My Sweet Petunia, I wanted to try out the Blueprint Christmas stamp set. I love that with the misti, the image can be restamped after painting or coloring so that the outline of the stamp stands out. These stamps are totally different from the ones I usually use, but I really enjoyed coloring them! For this snowman, I used acrylic paints on kraft paper and a background of patterned paper. 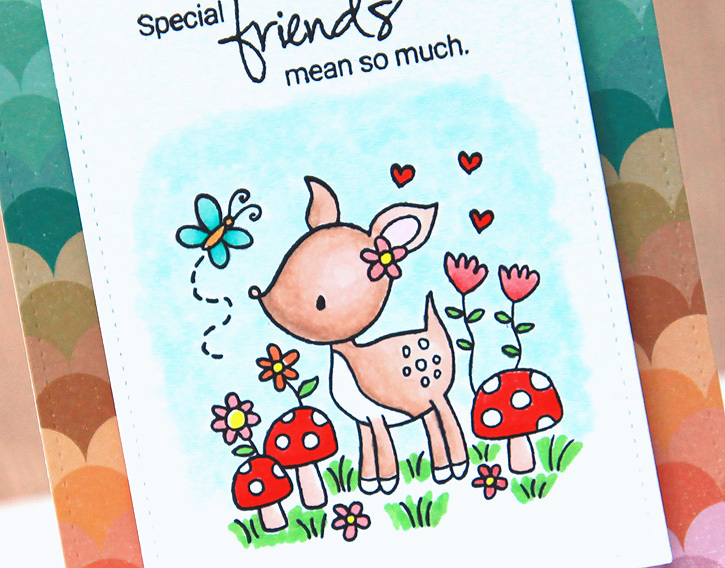 This card is colored with copic markers, and includes a tag cut from this die set with the sentiment from an Avery Elle stamp set. I colored the next two cards with copic markers and created the background by using my misti to stamp a repeating pattern like I did here. 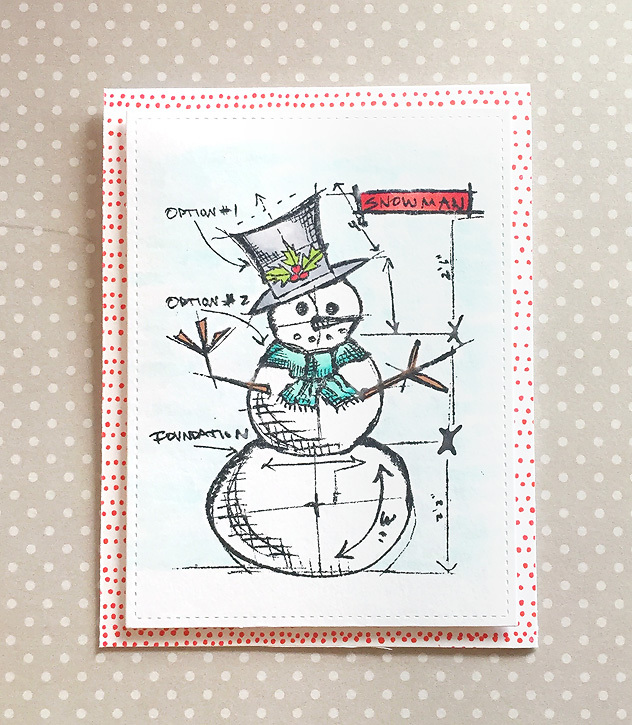 I have two more cards to share that I made with the Simon Says Stamp December 2015 card kit. I love the little cat and stack of gifts stamps included with this kit! 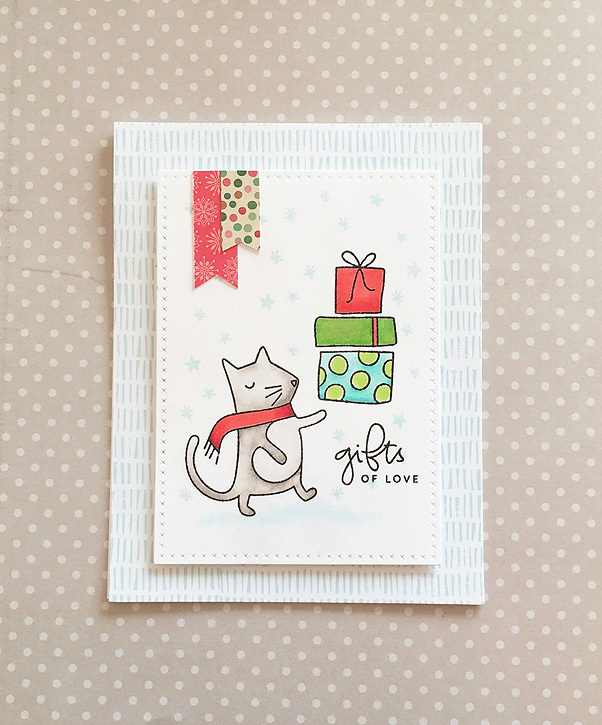 On the first card I colored the cat and gifts with copic markers. 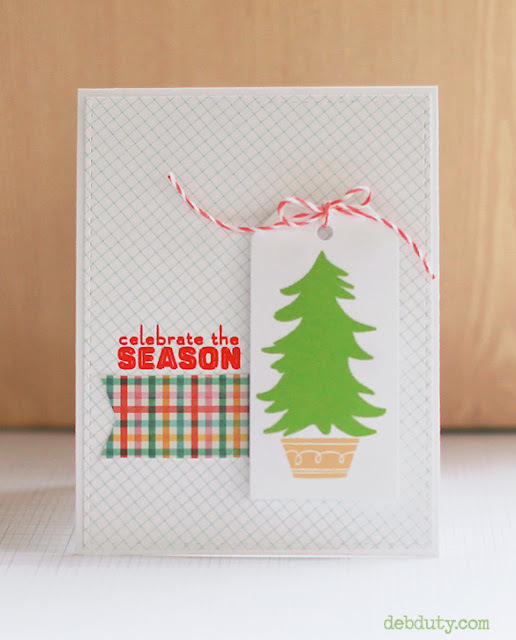 I added snowflake stamps in the background and some little banners from patterned paper. 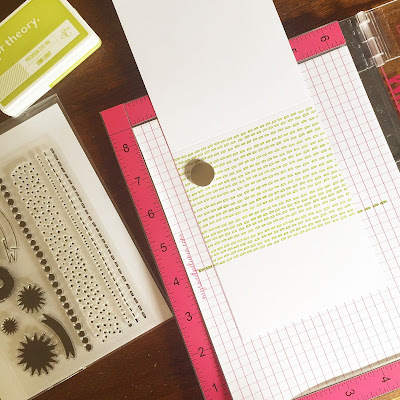 The white panel is cut with the cross stitch rectangle die. On this simple card, I stamped the gifts on kraft paper using my Misti. Then I painted them with acrylic paints. Once they were dry I restamped in the same spot using my Misti again. I added a strip of zig zag washi tape and a little gold paint and sequins. The village dies from Simon Says Stamp cut out three little houses and two trees in different sizes. 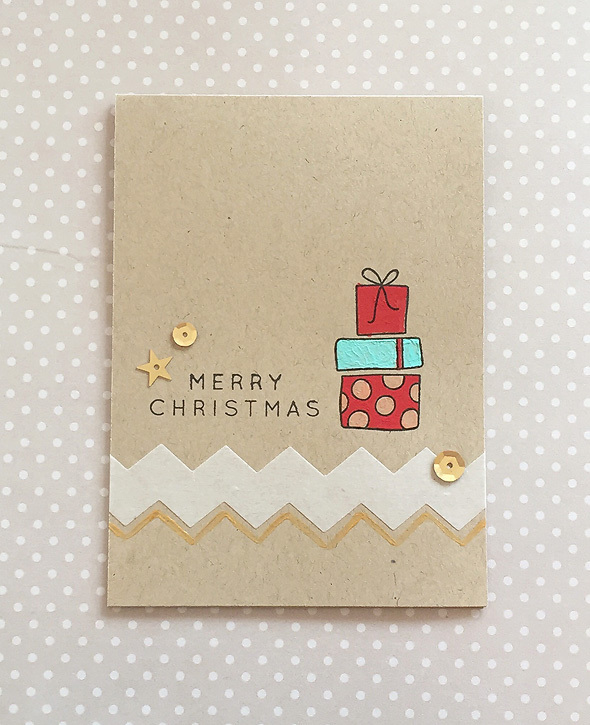 I paired these shapes with the slopes and hills dies and the small and large stitched rectangle dies to create this card. I cut the trees and houses out of white cardstock and then colored them with copic markers. I backed the houses with a smaller piece of cardstock colored with a yellow copic marker. The snowflakes and sentiment (from an older Studio Calico stamp set, Cinnamon Spice, that is no longer available) were stamped with white pigment ink. By the way, there's an awesome deal on my favorite cardstock, Neenah Solar White 80#, at Amazon right now. It's my favorite for copic coloring and the weight is great for card bases. I'm linking up with the Simon Says Stamp Monday Challenge where the theme is "just a pinch" this week. 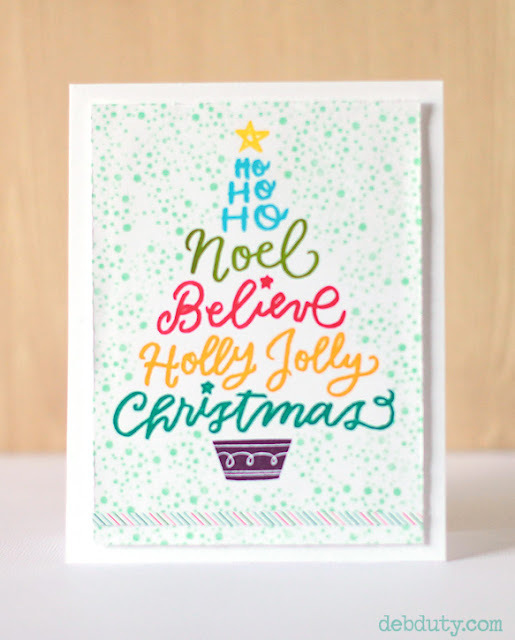 I added just a pinch of sparkle by going over the sentiment, snowflakes, and trees with a wink of stella glitter pen! 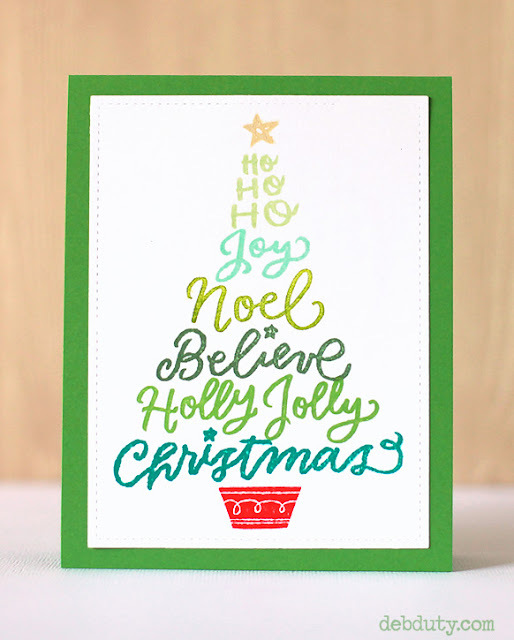 The scripty words from the Holiday stamp set by Jasmine Jones are so beautiful, and I love the way they fit together to form the shape of a tree. I made two cards with the same idea, but in different colors. First I used different shades of green and also a green card base. My Misti stamp tool made it easy to line up each word. 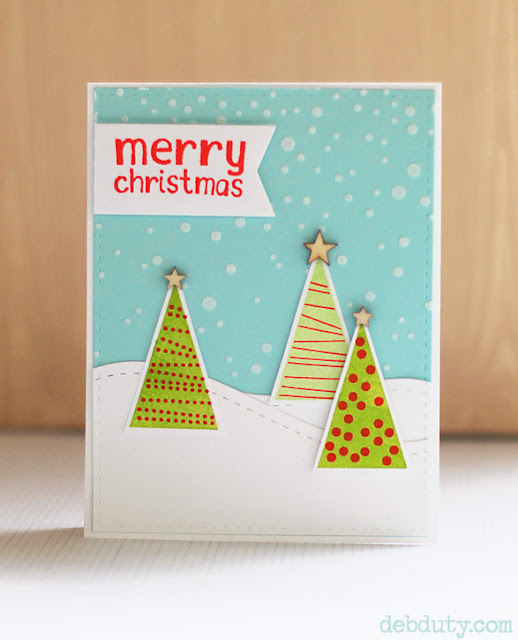 On this one I made the tree a little shorter by leaving out the Joy stamp, and I used a variety of bright colors. Then I added the clumps of snow by repeating that stamp all over the background. Here's another stamp set that I couldn't resist buying this year, Lawn Fawn's Toboggan Together stamps and dies. The deer and penguins are adorable, and I love all of the extra elements for making a cute winter scene! I made this card with the little deer and the presents with a background of snow embossed with white embossing powder using the stamp from Let It Snow. 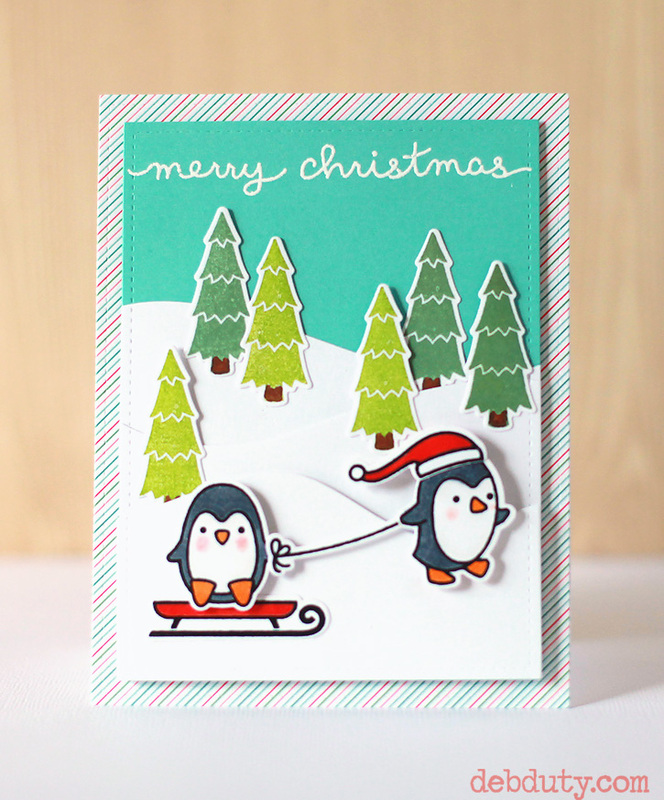 This card features the penguins with the little sled. I stamped the trees with Color Theory lime light and yes peas ink, then colored in the tree trunks with a brown marker. These stamps and dies have been out at my favorite store, Simon Says Stamp, but I found them in stock on Amazon right here! I have one more card made with this set that I haven't photographed yet. I'll share it soon either here or on instagram. And I think these guys would be so cute on tags. Hoping to make some before Christmas! 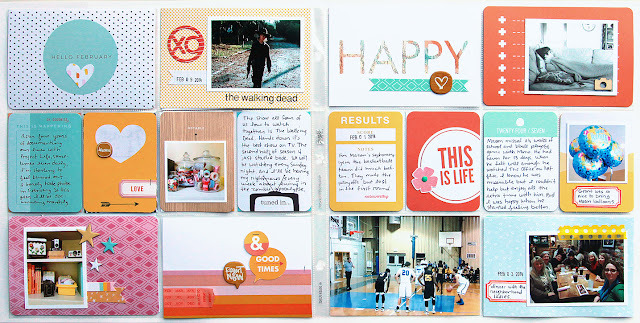 I decided to get the December 2015 Simon Says Stamp card kit, Gifts of Love, because I not only love the stamp set, but also the cute papers and really fun stickers. I'm using the stamp set for cards, but I'm saving the papers and stickers to use in a Christmas mini album that I'm planning to make to document this Christmas. 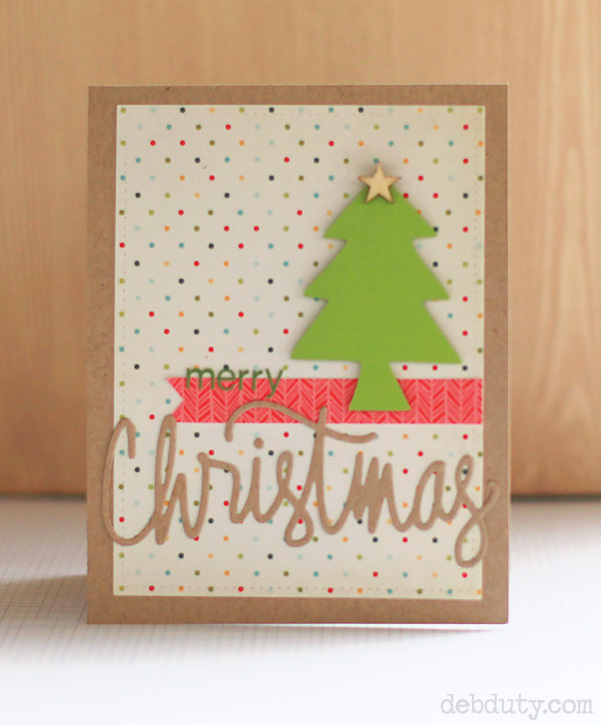 Here's my card using the tree stamps along with a notepad die and some sequins. 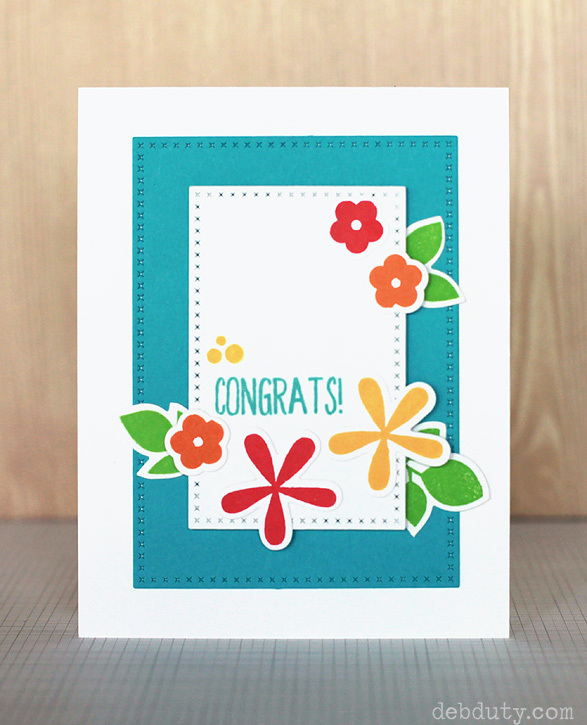 The background was created by applying Color Theory mint hint ink with a blending tool. 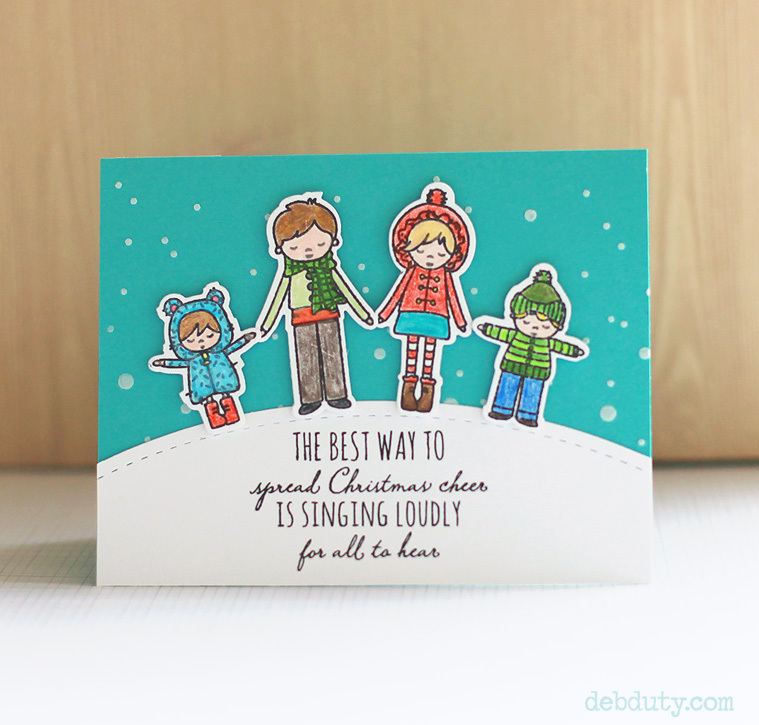 Linking up with the Simon Says Stamp Monday challenge where the theme this week is Christmas! 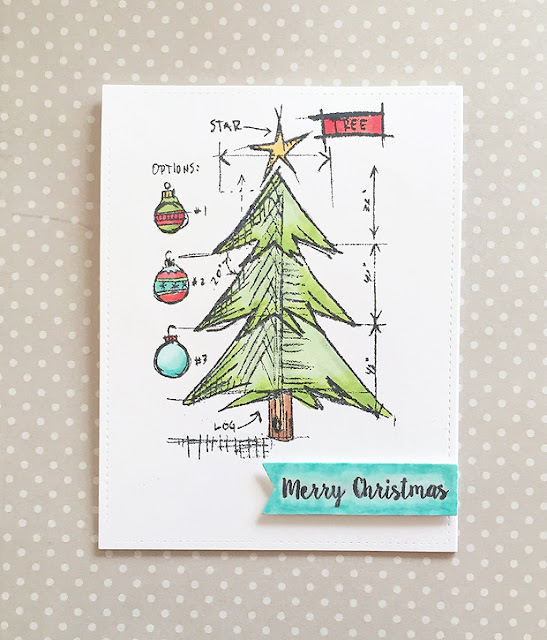 These days I'm focusing on using supplies I've accumulated over the last few years, but there are some new Christmas stamp sets that caught my eye, especially the Holiday stamp set by Jasmine Jones at Studio Calico. 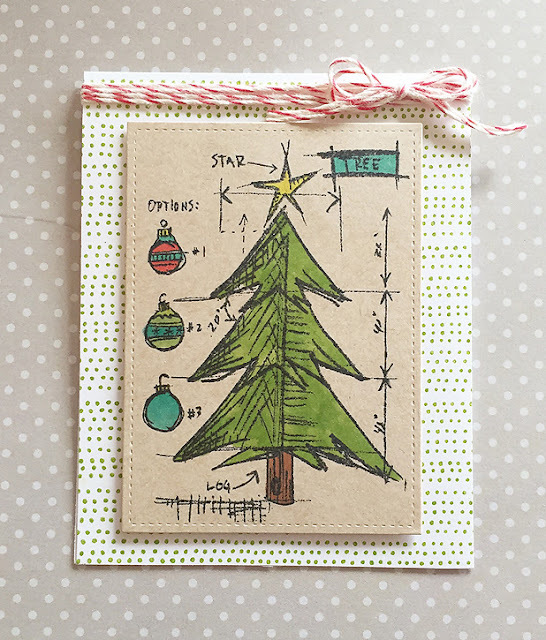 I love the fun shape of the tree, and the way the beautifully scripted words go together to form the shape of a tree is so clever! I was very inspired by this set so I've got quite a few cards to share over the next couple weeks. Here are some of the cards I made that feature the tree stamp. For the first one I used watercolor paper. I first stamped the tree and then filled in with a green copic marker since the paper is textured and the stamped image wasn't smooth. I watercolored in blue around the tree and then embossed the sentiment in gold and added the snow stamp all around the tree embossed in white. 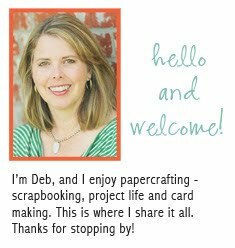 The background paper on this card is from this 6x6 grid pattern paper pad. The tag was cut with the largest tag from this tag die set. 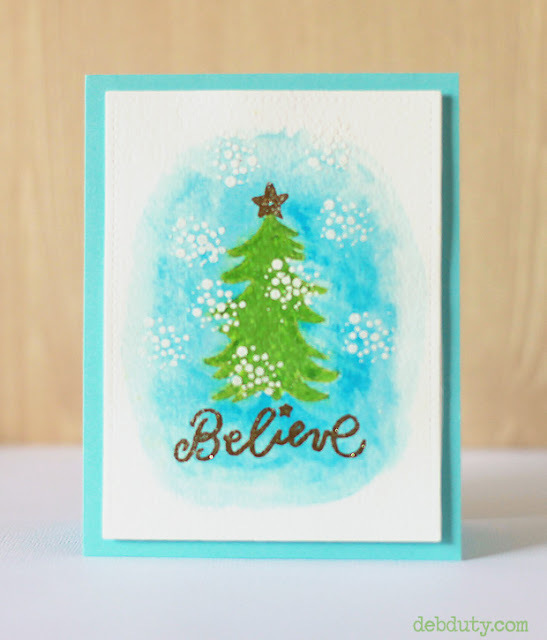 I used Lawn Fawn green ink for the tree. I love the Lawn Fawn inks because they are the smoothest dye inks I've tried. 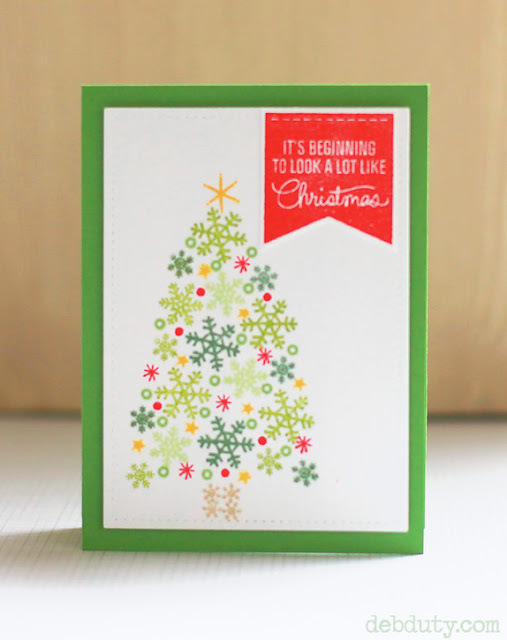 For this card I again stamped the tree in Lawn Fawn ink, then cut around it. 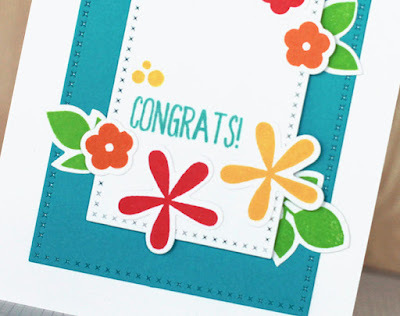 I added decorations from the stamp set in Color Theory Clean Slate ink and dots with a white gel pen. The blue background was scribbled with a Prismacolor pencil and the star is wood veneer from Studio Calico. I'll share cards that feature the scripted words from the Holiday stamp set soon. It's such a fun set and there's much more to come! Hi everyone! I'm back again to share some snowmen! 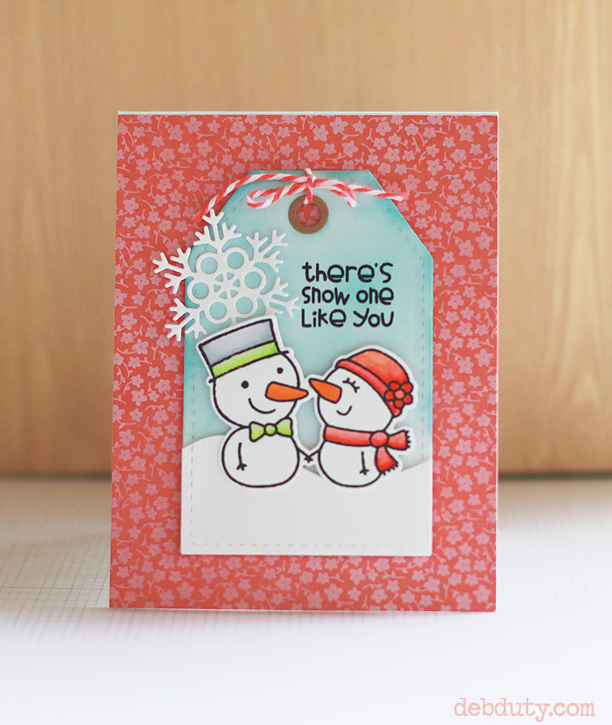 The Paper Smooches Cool Dudes stamp set is my favorite snowman stamp set. They're just so adorable! I shared this card earlier this year and I have two more to share today. The backgrounds are colored with distress inks, and I used copics markers for the snowmen. 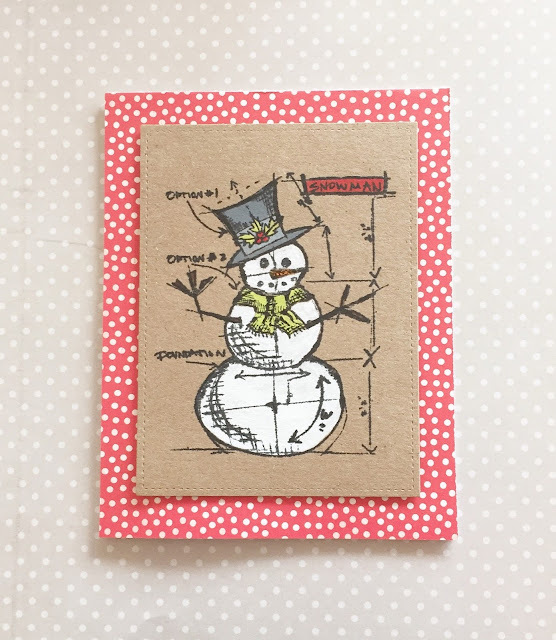 The snowflake dies can be found here and here and the tag die is by Paper Smooches. Linking up with the Simon Says Stamp Wednesday challenge today! Hey guys! 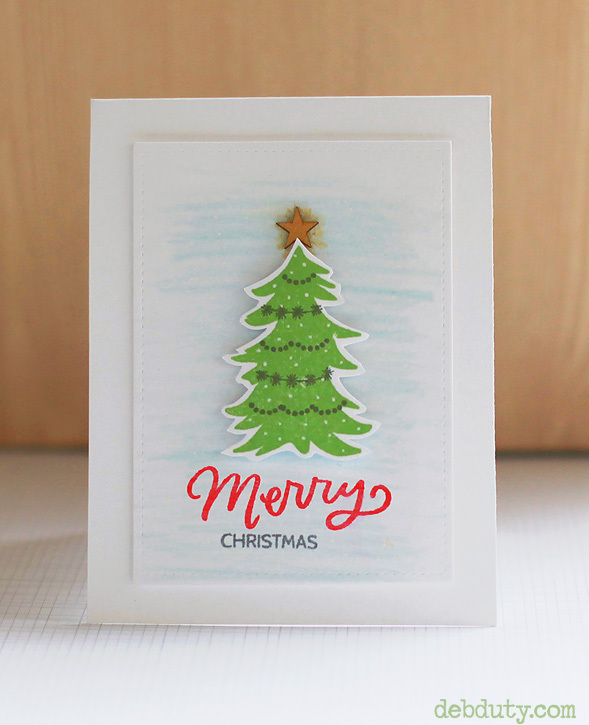 I'm sharing two more cards today with Christmas trees. For this one I used the stamp set from last year's Send Joy class at Studio Calico with a snowy background created with the falling snow stencil. 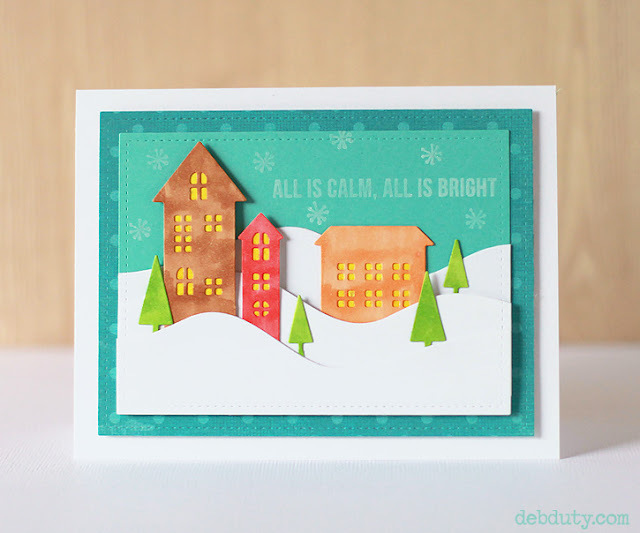 The snowy slopes were created with the slopes and hills dies and the sentiment is from the Lawn Fawn let it snow stamp set. This tree was cut with my silhouette. The "Christmas" was cut with a metal die from Studio Calico. I'll be back soon with more cards! It's been a while since I've worked on my project life album. I decided to take a break for 2015, but I still have a few unfinished months for 2014. I'm doing a spread for each month so it shouldn't take too long to catch up. Then I'll decide what I'll do with the photos I have for 2015. I'm using my stash of past project life kits from Studio Calico along with stamps and 4x6 paper pads. 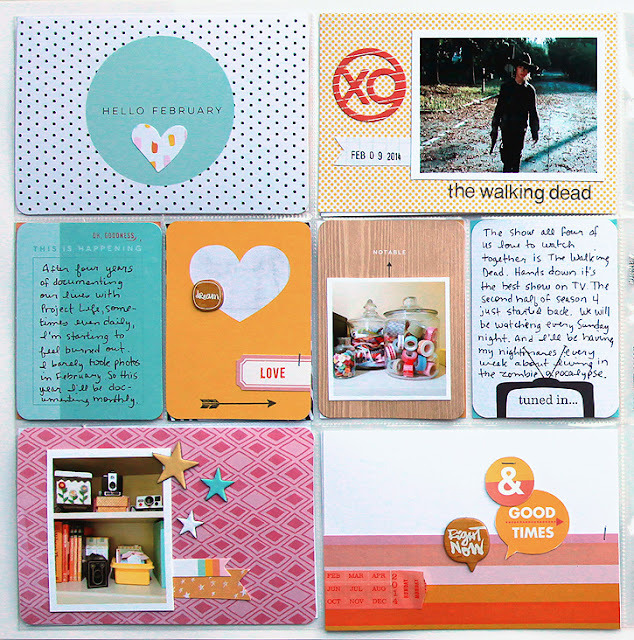 Plus I like to use the printable labels for journaling spots. I have lots leftover from last year. 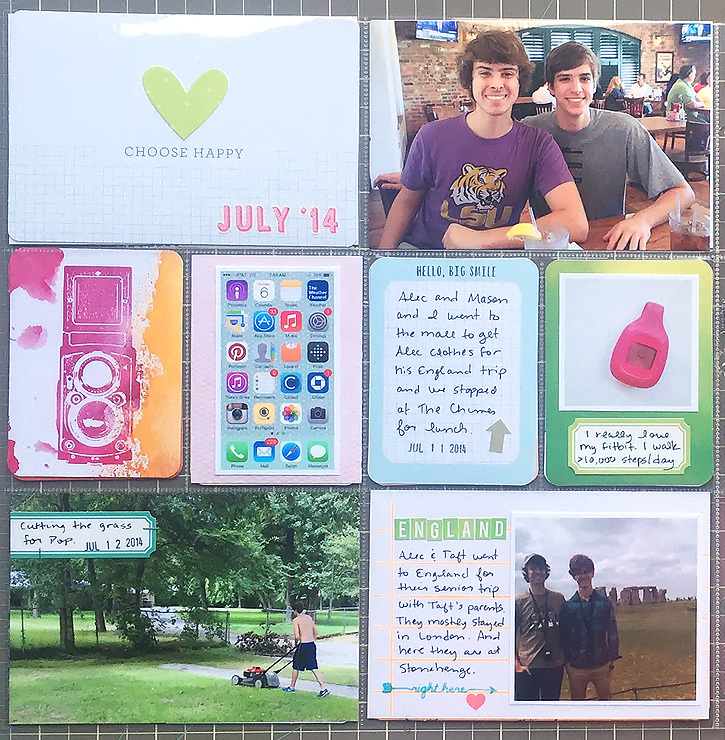 Here's my spread for July 2014. I chose cards that complemented the colors in the photos. I decided to focus on the pink from my shirt, fitbit and sunrise, plus the green from the grass with a little added yellow and blue. 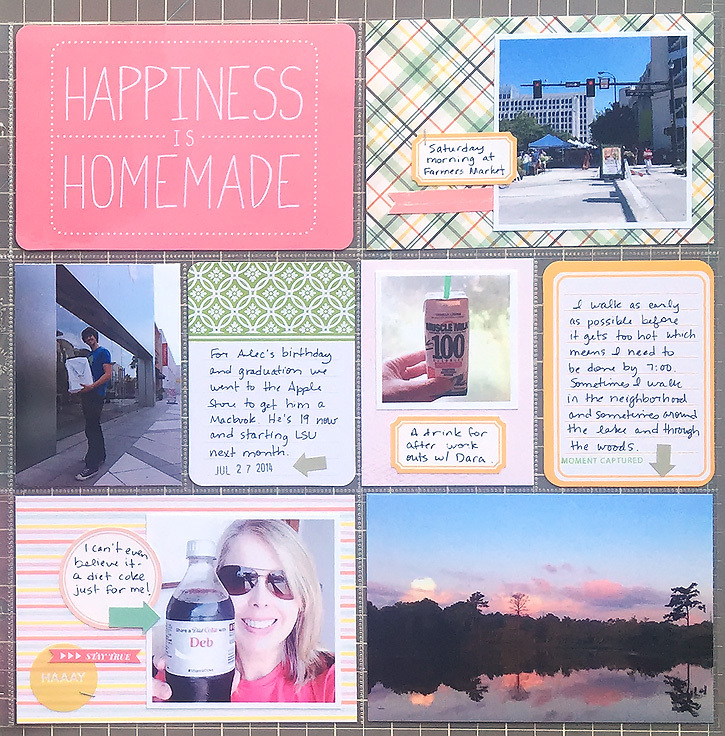 After documenting with project life for the past five years, along with traditional scrapbook layouts, I've figured out that it's my project life spreads that have the most meaning. 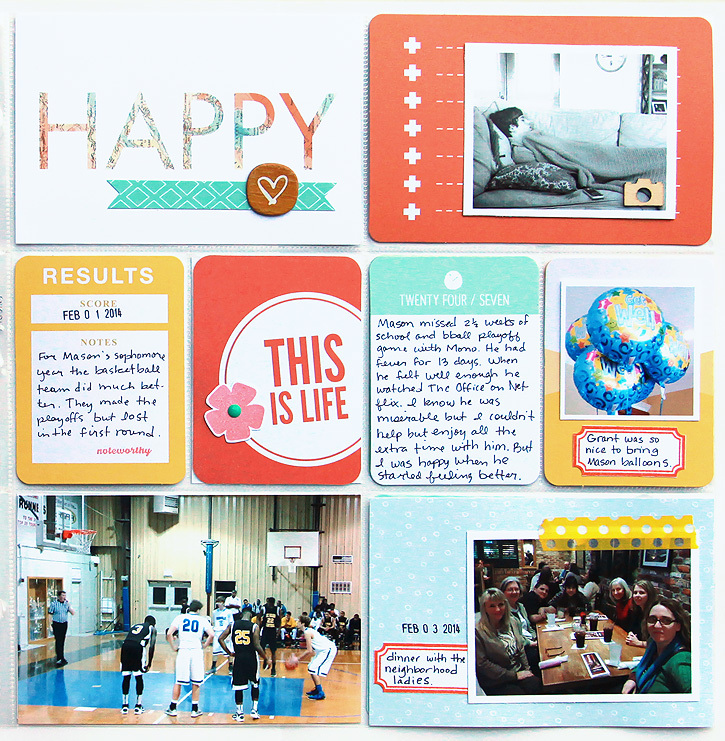 I hardly ever look back at my layouts, but I feel my project life spreads tell the story of our lives in the most meaningful way. Which makes me excited about finishing up 2014 and continuing for 2015! 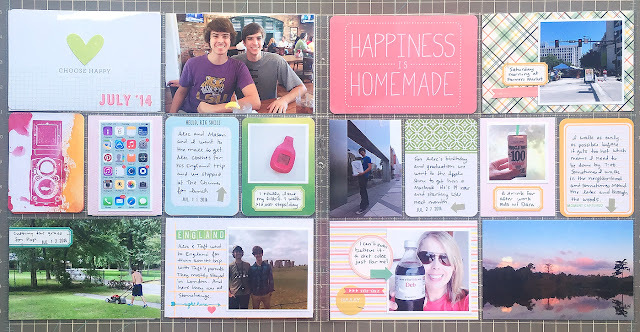 Even though I haven't blogged much this summer, I've still been making a few things here and there. 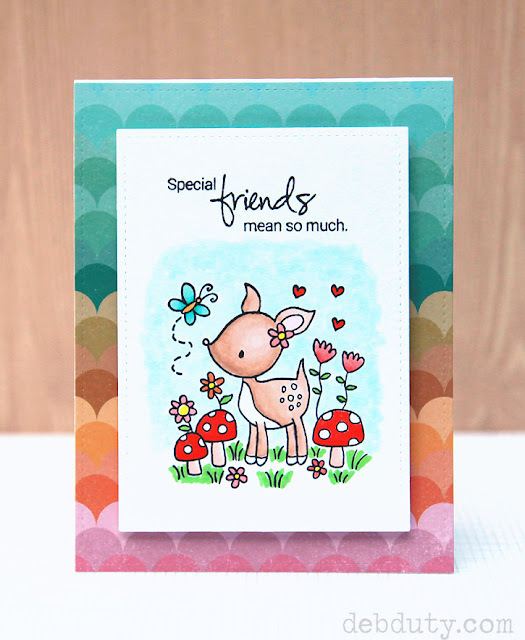 So here's a card I made a couple months ago with the Paper Smooches Reflections stamp set. 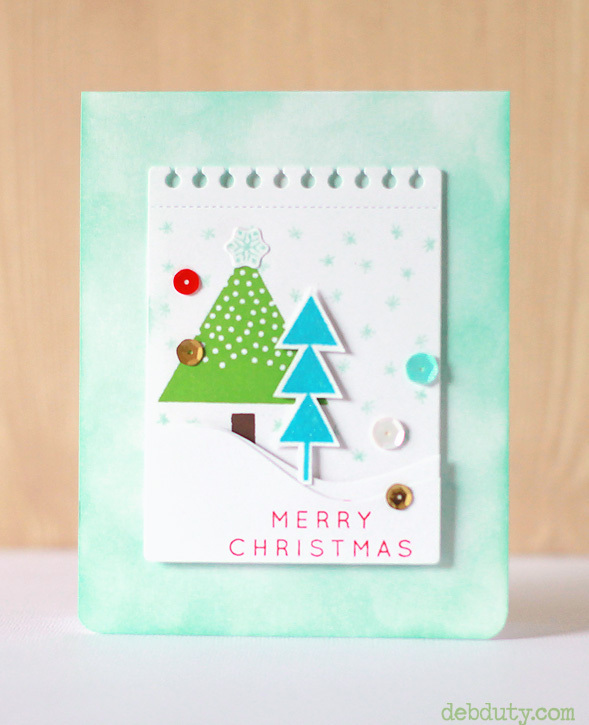 The white and teal panels were die cut with MFT Cross-Stitch Rectangle dies. The flowers were cut out with the coordinating dies. I've really enjoyed this stamp set with these cute, simple flowers. I have a couple more cards with the same stamps that I'll share soon!